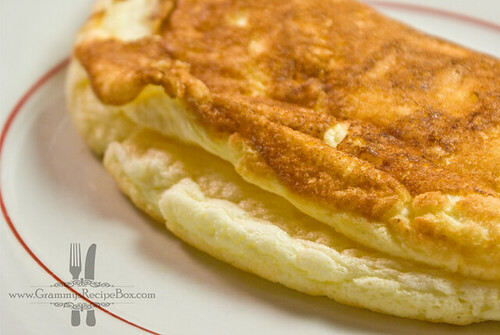 Although I've been a lifelong lover of scrambled eggs, it wasn't until my junior-high home economics class when we learned to make omelets that I actually tasted one. I loved making and eating them from that point on. I don't know why it took me so long, but I finally endeavored to make my great-grandmother's omelet recipe for the first time. Now I must fully disclose that I made this recipe twice. The first time I made it, I used a stainless steel skillet with an oven temp of 250F (121C). The second time I made it with a cast iron skillet (more authentic I thought) with an oven temp of 350F (177F). I gathered all my gear and ingredients. I decided to use kosher salt instead of standard table salt. Since salt would be the only seasoning I thought the kosher would give it more flavor. 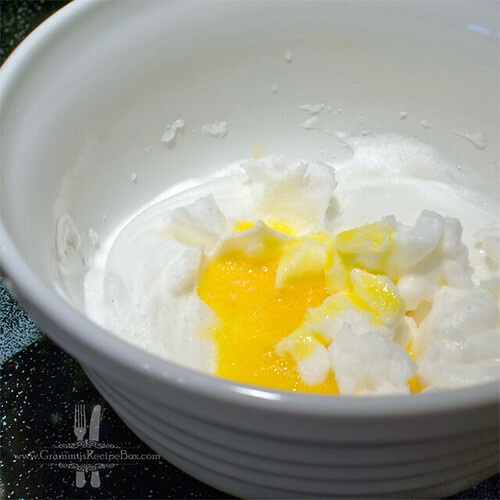 I followed the recipe by separating the egg whites from the yolks and then beat the whites with an electric hand mixer until stiff peaks formed. 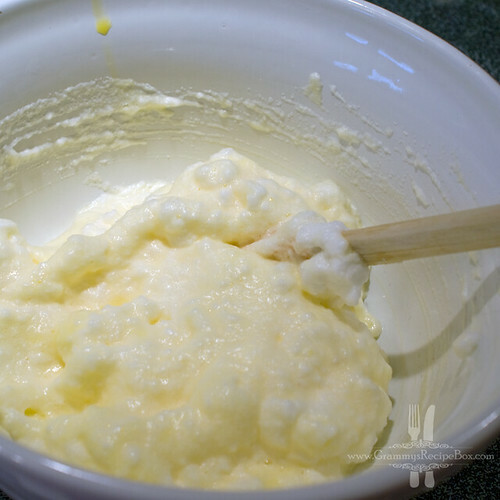 I found that mixing the yolks, milk and salt in a separate bowl before folding them into the whites worked best. I waited until the mixture was done before putting the tablespoon of butter in the skillet to melt on medium heat. That way I could get the eggs in as soon as the butter was melted and not run the risk of the butter scorching. 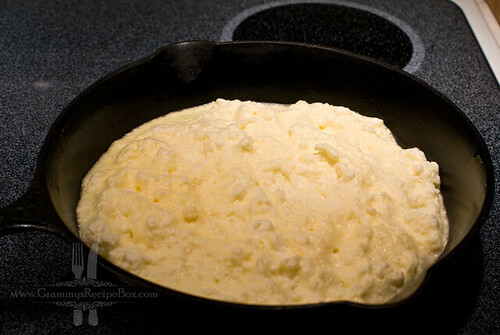 Unlike what the original recipe implies, the eggs didn't really "pour" into the skillet. I had to scoop them in and then use my spatula to spread them around the skillet until they were even. I was careful not to break down the air bubbles and keep them fluffy. The melted butter gathered around the edges of the eggs and started to seep up through the spaces in the egg as I pushed them around. It started to look really yummy. In the stainless steel pan that conducts heat very efficiently, the bottom browned really fast (too fast) in about 3 minutes. I liked the cast iron skillet better because it took a while to heat up and allowed the egg to slowly come up to temperature while it browned giving it a chance to begin to steam and cook the middle a bit before going in the oven. Once in the oven, there was a big difference between the omelet baked at 250F and the one baked at 350F. Hubby is pretty sure that the 350F is closer to the temp that a wood-fired stove would have been back when my great-grandmother made the omelet. I found the 350F temp to be the best, so he was right! 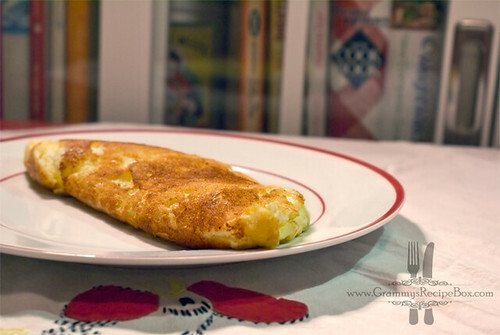 With just the salt for seasoning, we were both pleasantly surprised at how savory the omelet was. The kosher salt was a good call. The brown outside (usually a no-no with an omelet) added a wonderful flavor as I bit down through to the steaming fluffy inside layer. It reminded of the varied nuances of a fluffy buttermilk pancake the way the browned outside complimented the fluff inside. To add a bit of twist to the original recipe, I sprinkled a dash of lemon pepper over the top and we each had a taste. Oh wow was it good! The lemony zest and the savory pepper added an amazing layer to the already delectable omelet. What surprised me was how filling the omelet was considering that there wasn't anything else in it except eggs. 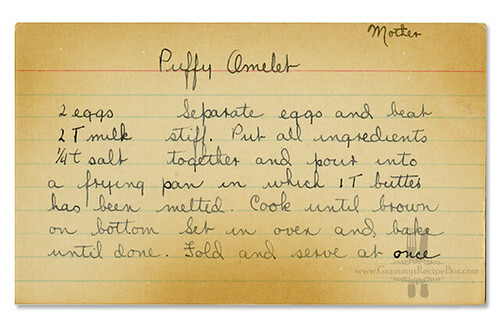 I can imagine this recipe would make an excellent base for many omelet varieties, but I can also imagine that I'd have to have a hearty appetite or share it if I added more ingredients. My hunch is that adding veggies, cheese, bacon or ham would probably work very nicely as long as it was added after the omelet had browned but before it went in the oven. Preheat oven to 350F (177C). 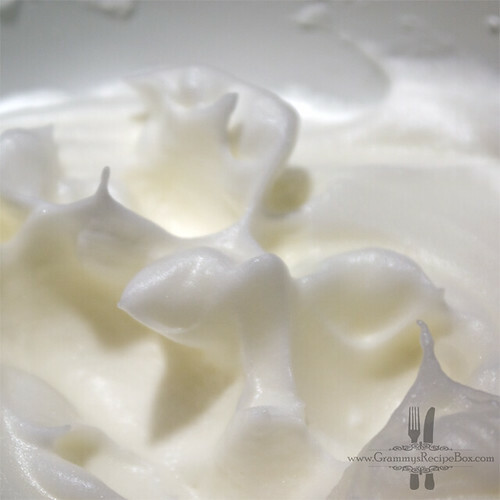 Separate eggs and beat whites until stiff peaks form. In separate bowl combine yolks, milk and salt and mix thoroughly. 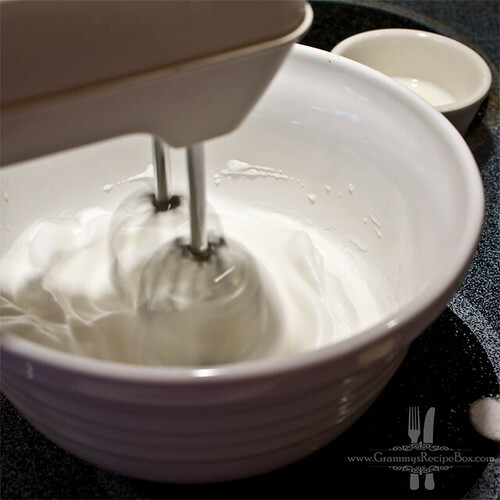 Gently fold yolk mixture into egg whites mixing only enough to combine ingredients being careful to not break down the air bubbles. Heat cast iron skillet on medium heat to melt butter. 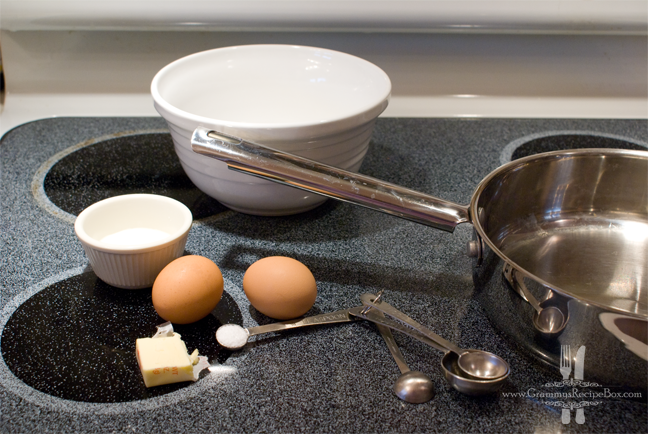 As soon as butter is melted, gently spoon egg mixture into the skillet and spread gingerly to fill pan. Cook until bottom of egg mixture is golden brown. Remove skillet from cooktop and place in oven. Bake for 4-5 minutes (egg mixture to bounce back when touched instead of the froth breaking under pressure). 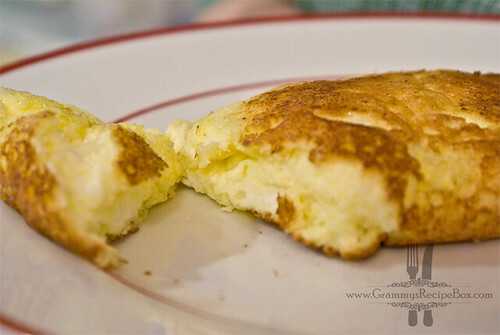 Fold omelet in half. Sprinkle with a dash of lemon pepper. Serve at once. If you make this recipe (especially if you add your own twist to it), I'd love to hear from you. 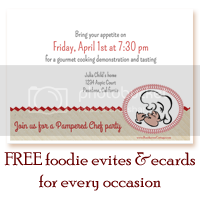 Make sure and take photos so I can see your culinary creation! That is definitely Elsie's writing... I love to see her hand writing! Beautiful photographs. You make everything look so yummy. I love that you are actually making the old recipes from the box.